I hate to advocate drugs or alcohol at a rock concert for everyone, but they’ve always worked for me. Perhaps one thing more dangerous than paraphrasing the late, great Hunter S. Thompson is getting trashed before you go to a rock concert. That’s the disclaimer for this concert memory and cautionary tale, going way back to January 1976 when Bob Dylan brought his Rolling Thunder Revue to the Houston Astrodome for “The Night of the Hurricane II.” I mean: I know I went, I remember some of it, but everything else is a bit hazy. One thing I’m sure of is that my concert companion that night was beer – a lot of it. 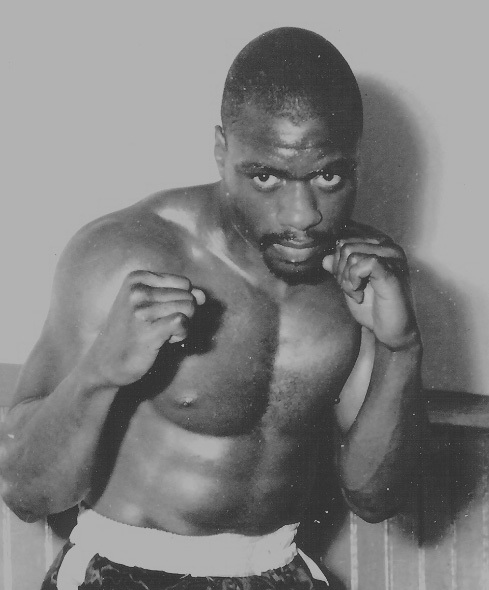 Here are the facts: Rubin “Hurricane’ Carter was a middleweight boxer who had title aspirations in 1966. He was arrested and convicted for having a part in a tavern robbery in which three white people were killed. Many people including Dylan, believed Carter, a black man, was an innocent target of a racist judicial system. Dylan, who was touring with his large Rolling Thunder Revue at the time, held a huge fundraiser in Madison Square Garden in 1975. 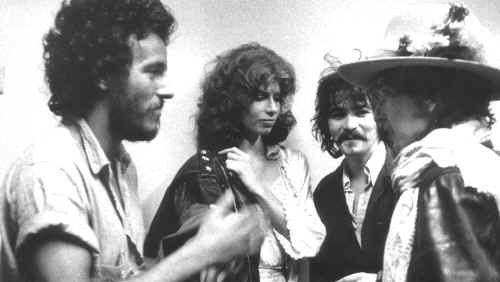 It featured Dylan, Joan Baez, Roger McGuinn, “Ramblin'” Jack Elliott, T-Bone Burnett and other celebrities and hangers-on who might turn up for a concert date or two. 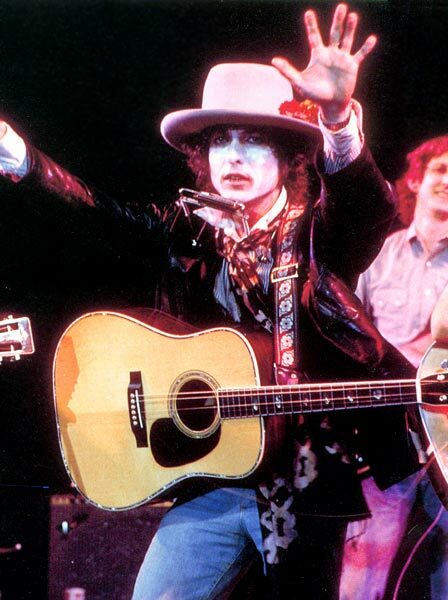 That event was so successful they decided to have another in Houston just as the Rolling Thunder Revue started its Southern swing in early 1976. The second event was poorly publicized, and very few people wanted to see Dylan’s bizarre stage act (he wore kabuki makeup on his face), much less support some boxer they never heard of. So it was fairly easy to walk up and plunk down 15 bucks for a ticket. Trouble was, it was much harder to avoid the many rock and roll “tailgate parties” out in the parking lot and as a result we walked in to the show already four sheets to the wind. The Dome, which could hold about 70,000 for a sporting event, probably had around 6,000 people in it for Dylan’s show. They dragged this stage out in the middle of the rodeo arena dirt and even the best seats were at least 150 feet away. And I do remember: the sound was horrible, bouncing around the cavernous Dome like an incomplete pass. Despite the best efforts of the ushers, people scrambled into the highest reaches of the Dome to hear the music better and it was kind of funny to see a few thousand people scattered around the big stadium. That made it seem even emptier. What I do recall of the music was only so-so Dylan: “Hurricane,” the song he wrote about Carter, was a highlight. Even today, that is an amazing song. As was “Romance In Durango” – the album Desire had just been released and people knew the songs already. Apparently there were guest stars (Ringo Starr, Carlos Santana, Stevie Wonder) but with the sound problems and the drunken state of my brain, those have been lost to the mists of time. This was the last night that Dylan ever performed “Hurricane” live. Eventually, in the late 1980s, all murder charges would be dropped against “Hurricane” Carter and he was set free. The Night of the Hurricane II wasn’t much help – the event was a disaster. It lost money, and when combined with the more successful event in New York City, the effort just about broke even. Listening to recordings of the Rolling Thunder Revue, I’d say Dylan probably also artistically broke even that year. This entry was posted on June 2, 2008 at 8:27 pm and is filed under Uncategorized with tags Bob Dylan, Joan Baez, Roger McGuinn, Rolling Thunder Revue, Rubin "Hurricane" Carter. You can follow any responses to this entry through the RSS 2.0 feed. You can leave a response, or trackback from your own site. stumbled across your site while looking up some info regarding the rubin carter incident and dylan’s benefit concerts. I also attended the night of the hurricane II on 1/25/76 and yes beer and drugs were also my companion of mine. i was living in wichita falls at the time and a buddy of mine decided to drive down. it was a wild time roaming around on the dirt floor of the astrodome and trying out all the seats to find the best acoustics. for me, other than dylan performing hurricane, i would have to say that stephen stills showing up to play a couple of songs was the highlight. i was able to get down as close as they would let me to the stage for his performance. thanks for you take on the concert.. it really brought back some old memories.. The only blonde Brit from Dylan’s Rolling Thunder Revue was Mick Ronson, the legendary guitarist who played with David Bowie and Ian Hunter, among others. I don’t recall that he did a song by himself (of course, I don’t recall a lot of things from that night) but if he sang about a “spaceman” that would fit the bill because he was one of Bowie’s Spiders from Mars. I attended the concert and have very different memories. I remember there being plywood on the floor and the stage being set up in what would be center field, as the Astrodome’s seats were set in the baseball configuration. I was definitely closer to the stage than 150 feet although the stage was set high above the playing field. I remember a musician named Shawn Phillips with hair down to his waist played first but wikipedia says that he is from Fort Worth so he might not be the musician that Gunny is asking about. This was more than Dylan’s Rolling Thunder Review. Yes Stevie Wonder performed and Ringo was on hand but did not perform. As I remember Isaac Hays was the MC and performed but I don’t recall Carlos Santana though he might very well have been there. Why is there a picture of Bruce Springsteen and John Prine posted here? Neither were at the concert, I would remember I’m a big fan of both. Plywood? Wow, you must have been sober. Now this was more than 30 years ago and I admit I was pretty blasted, and I don’t want to argue with your memories man … because you are probably right about most things. However, one thing you said doesn’t make sense to me. I was a sportswriter for a newspaper around that time and I covered a lot of events in the Dome – without the benefit of being drunk. And I remember it pretty much like this: Night of the Hurricane in January, Demolition Derby/car/motocross events in the Dome during the winter, Livestock Show and Rodeo in Feb.-March. And even in 1976, baseball season started in April. So I’m not quite sure why you remember a baseball configuration. There could have been some basketball thing going on before or right after. Hope you enjoyed the show.